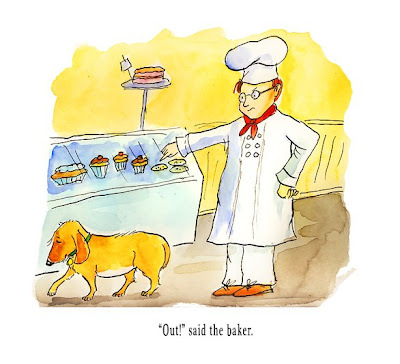 Maxwell got canned from his job as watch dog..... after paying more attention to the strawberry cupcakes than to the robbers who broke into the bakery. The books are going well - right now I'm working on the dummy for The Little Green Pea. It's been quite a challenge as there aren't many books starring peas as main characters so I've really had to go with little reference save for realistic photographs of pea plants and leaves. I finally decided to base some of my characters on the classic images of moons and their faces. All you need is some green tint and you've got a pea instead of a moon! I have three spreads left to do and the cover and off it will go to the art director and editor. While they review that I'm going to start on the next book, Raj. Now, I've drawn lots of cats in my career and have owned cats most of my life so I'm looking forward to drawing Raj (the bookstore kitty who thinks he's a tiger). Well the drawing desk is calling once again. I'll try to post more often!